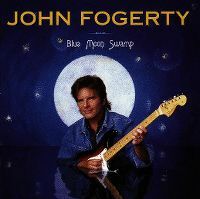 Former Creedence Clearwater Revival leader Fogerty's first album since 1986's broodingly flat Eye of the Zombie, '97's Blue Moon Swamp finds him returning to the roots-rock ways of his old CCR glory days. Deceptively relaxed in the Creedence manner, this collection seeks to evoke the mood and tone of Southern swamp blues, with generally successful results. Highlighted by rockabilly-tinged tunes like "Southern Streamline" and "Hot Rod Heart," the album's clear standout track is "One Hundred and Ten in the Shade," on which Fogerty, ably backed by gospel vocal group legends the Fairfield Four, uncannily reconstructs the sound of Southern field hollers. Gewann einen Grammy und bekam (in den USA) Aufmerksamkeit. So gelungen fand ich es nicht da es etwas zu weich gespielt ist. Klasse Album. Wer mit eine Countrystyle etwas anfangen kann, wird dieses Juwel schätzen. Toll. Empfehlenswert. 2 Songs dieser Platte gehören zum besten was Fogerty je spielte, insgesamt ein gut. 5* sind das sicher! Die 90er haben auch hier ihre Spuren hinterlassen und teilweise kommen die Titel ein wenig zu weich daher, aber grundsätzlich sind alles starke Nummern. Fogerty Qualität. The worst album I have ever heard! I really hated it when my parents played it all the time when I was younger. Vocally it's woeful and depressing and there is nothing even remotely interesting or enjoyable about any song on this crap album. The worst song is by far "Southern Streamline".